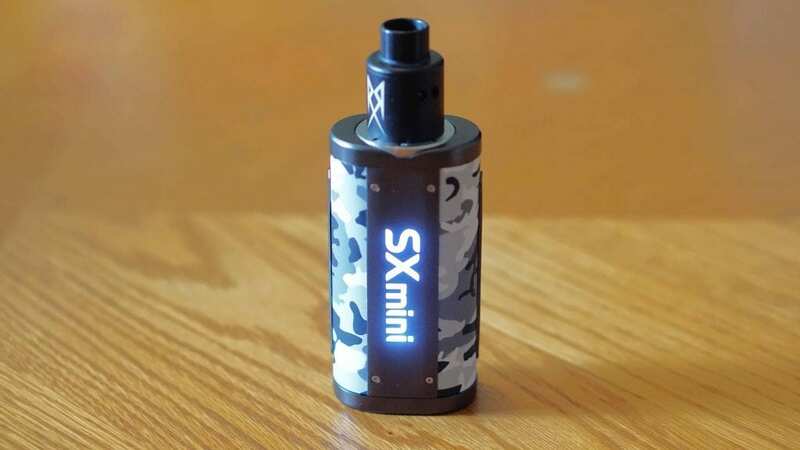 YiHi SXMini G Class Review - Daily Vaping Deals & The Best Vape Product Reviews at Vaping Cheap! YiHi has released quite a few vape mods over the last couple of years, and they’re known for their excellent quality. Today, we’re taking a look at one of their newer devices, the G Class 200w TC Box Mod. Although it’s not incredibly new to the market, it still is a staple in their lineup of box mods, and is powered by the SX550J chipset which incorporates a joystick control system. Before getting any further, we’d like to thank VaporFi for sending this device our way for the purposes of this review. We’ll cover our first impressions, usage, performance, pros and cons, and conclude with whether or not we recommend the YiHi SXMini G Class! Click Here to Check Out the YiHi SXMini G Class 200w TC Box Mod! The G Class 200w TC Box Mod by YiHi comes in a rather simple looking box, but it does look a bit classy. There aren’t any designs or “loud” images on the packaging whatsoever, which I think is a good thing. Sometimes it’s nice to see simple packaging, and let the product speak for itself. Once you slide open the packaging, you’re immediately met with the G Class, and something to note here is that it comes wrapped in plastic, further ensuring that your device comes in pristine condition. The color I received was the Urban Camo, which is a newer color option, but there’s other colors available such as Carbon Fiber, Forest Camo, Ocean Camo, Classic Black and Lux Gold. The Lux Gold is a special or limited edition; therefore coming in at a higher price tag. Also included in the box, you do receive a nice USB cable (for charging and firmware upgrades), warranty card, and user manual. My first impressions of the device itself was that it’s incredibly well made and feels of great quality. This is to be expected of course since this isn’t your budget device. Something else I noticed right away is the large 510 connection, which is centered and the large color display screen right on the front. On the front of the device, under the screen is where you’ll find the joystick control. Now, I wasn’t sure how I’d like using this, but this is something we’ll get into later on. The battery door is solid in place with no movement whatsoever. 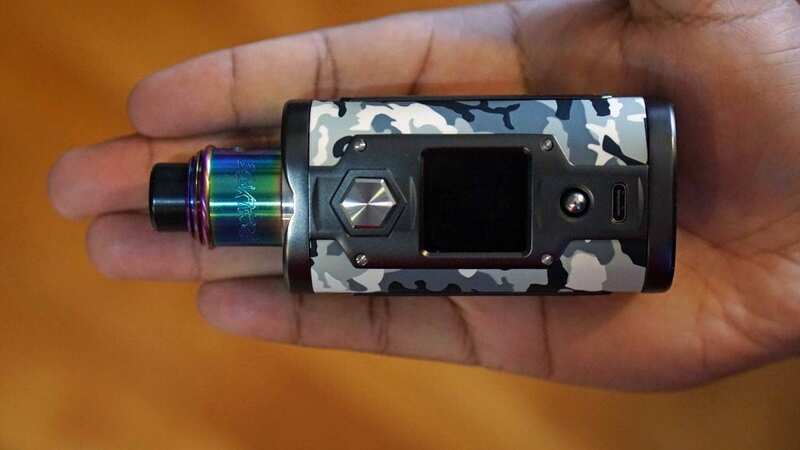 In addition, the size of the G Class is about average when it comes to dual 18650 box mods, it’s not too large nor is it tiny. I think it’s just about the right size in my opinion, and it does feel comfortable to hold. The fire button is on the front as well, which may be something you’d like or not like. I personally don’t mind the front firing button. On the side, there are some plates with engravings. Although they may look like they’re effect the comfort of the mod in a negative way, it actually makes it more comfortable to hold. There are no sharp edges on this device at all, which is always a good thing. The fit and finish of this device is simply fantastic. All in all, my first impressions of the YiHi SXMini G Class 200w TC Box Mod was great! I had zero cons to be mentioned and was impressed by its build quality and form factor. The G Class by YiHi does require 2 high drain 18650 batteries for operation, and the battery door is located at the bottom of the mod. There is a latch there which allows you to easily open the battery door and the markings are clear in how to insert your batteries. This device is wired in series, so do keep that mind. When inserting your batteries and closing the battery door, it does require some effort. You have to make sure that you lock the battery door into place with the latch. Now, this was kind of annoying sometimes, and I do wish it took a bit less effort to do this, but I must say once that battery door is closed, it’s very secure. Once you insert the batteries, the device will boot up, but it does not turn on completely. To turn on this device, a simple 5 clicks of the fire button is required. Now, I will say up front that it did take some time to get used to the joystick control system, as most other mods do not utilize this type of control system. Once the device is on, you’re met with a vibrant color display screen. I will say that this screen is definitely one of the better color displays I’ve seen on recent vape mods. Now, when you’re on the home or vaping screen, the joystick can be used for a few things depending on which direction you push. If you pus the joystick upwards, you can quickly adjust the brightness of the screen. There is a light on the back as well that shows “SXmini”, and depending on the brightness setting will determine if it’s on of off. Setting the brightness level to 2 or less will turn it off, but the screen will also dim. However, at this specific setting, it’s still quite easy to see everything on the screen clearly. Pressing the joystick to the right, you can quickly switch between the different modes or wattage settings you have configured, and there are 5 in total. Pushing the joystick to the right will allow you to change the output power or choose between the SXi-Q modes, which are basically curves. There is also eco, soft, standard, powerful and powerful+. When pressing the joystick in, you can quickly swap between temperature control modes and adjust the settings from the screen in regards to what TC material, temperature and more. You can also adjust the wattage as well, and do keep in mind that you can configure 5 different settings, so you can easily swap between preferred wattages. Now that’s covered, I’ll quickly go over how to access the menu and what can be done there. For one, 3 clicks will lock or unlock the G Class. 5 clicks will enter the main menu, and this is where you can turn the device on or off. Once you enter the menu, there are a lot of settings you can adjust such as TC modes, TCR, wallpaper, various modes, standby time, Bluetooth, time settings, select coil, and much more. This device is compatible with an App via Bluetooth, but I honestly felt no need to use it. You can use it, and I do recommend checking out some videos before doing so, as this App will allow you to further customize and dial in settings quickly. 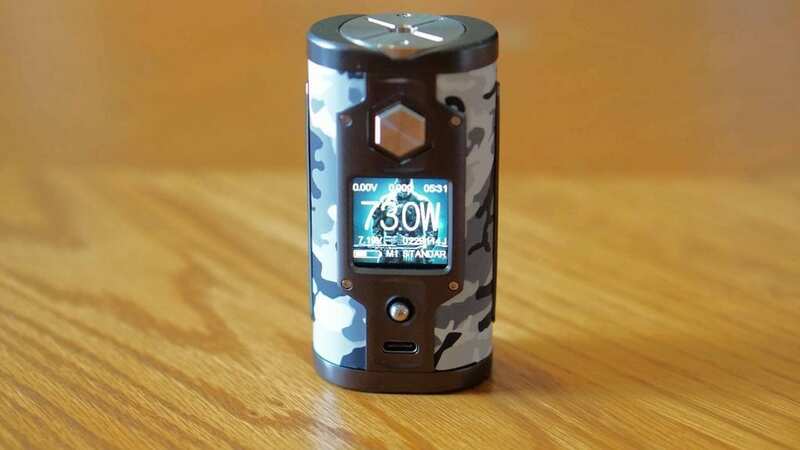 With simply mentioning how detailed this device is in regards to customization and how many different settings there are, this device is more suited for the advanced vaper. The beginner vaper will certainly be overwhelmed with all of these options in my opinion. Like mentioned previously, it really did take time to get used to this device and the joystick control. If you’re used to YiHi mods or devices that are powered by YiHi chipsets, then it might not take that long to get used to since it’s relatively the same, but now everything is controlled by the joystick. After a few days of heavy usage, I did get used to it and didn’t have any issues navigating through the menu system. Something I do want to mention is the 510 connection. It is quite large, so smaller atomizers such as 22mm, may not look the best. With the trend of atomizers this year and last year being larger, it’s not that big of an issue, but it’s something worth mentioning. Also, a huge pro is that atomizers up to 30mm will sit flush with no overhang! In addition, all of my atomizers I used with this mod made a connection with zero issues. Although this device did take some time to get used to, it still was a pleasant experience using this box mod. It was very comfortable to hold and use, and once I got used to it, I was able to quickly navigate through the menu with no issues at all. What’s even better is the centered 510 connection that can house 30mm atomizers! As mentioned previously, the YiHi SXMini G Class is powered by the SX550J chip and requires 2 high drain 18650 batteries for operation. In addition, it does have a maximum wattage output of 200w, and while I don’t have the necessary equipment to test whether it actually delivers this amount of power, I can certainly say it vapes like it does. As always, if you’re vaping at these higher wattages, be sure to use high drain 18650 batteries from trusted vendors. I typically vape between 50w and 80w, so I was getting plenty of battery life. While vaping on and off throughout the day, I can easily get through most, if not all of the day with just one pair of batteries. Of course, if I were chain vaping or vaping consistently at higher wattages, the battery life wouldn’t be as good. Also, I do want to mention that as soon as you hit the fire button, it fires instantaneously without any delays. The different power modes (powerful and powerful+) did come in handy with exotic coil builds such as Fused Claptons or Aliens. When it comes to temperature control, it does offer Ni200, Ti, SS316L, SX Pure and a TCR mode. When vaping this device in its pre-set SS316L TC mode, it performed flawlessly, and I didn’t feel the need to adjust any settings. The temperature control vape experience from the SX550J chip is definitely on par with the likes of a DNA box mod, and I really couldn’t tell the difference between the two. I was quite impressed by its performance, but I was expecting it to be. With how it performs in stainless steel 316L mode, I can confidently say that it’ll work well in Ni200 or Ti TC modes. I personally don’t vape other wires in TC mode aside from stainless steel. Overall, the performance of the YiHi SXMini G Class was fantastic. I had zero complaints when it came to its performance, and can say it’s one of the best performing vape mods on the market today. In conclusion, the YiHi SXMini G Class is an excellent performing box mod that offers the vaper the ability to really dial in preferred settings, and fully customize their device. Not to mention, the build quality is top notch, and it’s very comfortable to hold and use. I do love the centered 510 connection, and the fact that 30mm atomizers sit flush with no overhang. This is something that can’t be said with too many dual battery devices. Although it’s an incredible performer, is does have some minor cons with it. For one, it will take some time to get used to the joystick control. As mentioned before, if you’re familiar with other YiHi devices, it may not be as time consuming. However, for the some vapers, it may just be too complicated. There are some vapers who prefer something more simplistic, and this isn’t that device. In addition, the battery door is a minor annoyance as it does take a good amount of effort to close it fully. This really isn’t a con, but something worth mentioning. It does stay in place firmly though, which is a good thing. The last con that was mentioned is smaller atomizers not looking great due to the large 510 connection. This is subjective. Overall, the YiHi SXMini G Class 200w Box Mod has become one of my favorite dual 18650 devices, and will continue to stay in my daily rotation of mods. It feels great in the hands, and the performance is second to none. If you don’t mind its higher price tag or simply looking for a box mod that offers tons of features and customization, then the G Class is definitely recommended. We hope you find this review helpful in finding the right vaping device to fit all of your vaping needs! Feel free to leave any questions or comments down below! Thanks for reading!